The Inventory module allows for firm control and detailed tracking of inventory on all levels, including plant-floor inventory. 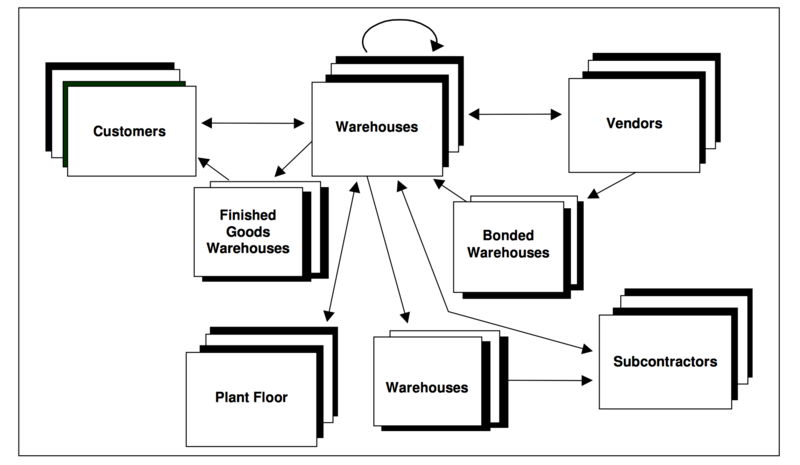 The module supports the management of raw materials as well as manufactured goods; of warehouses and bins both within and outside the organization (including control over the flow of materials and processed parts to and from a subcontractor); and full inventory tracing, from the moment of receipt into the warehouse. Quality assurance features include the definition and assignment of laboratory test results (including Certificates of Analysis), the methodical handling of malfunctions and the complex analysis of inventory that provides a continuous flow of pertinent administrative and financial information. In a manufacturing environment, Priority provides an up-to-date picture of WIP (plant-floor inventory), including inventory of kit components that have been issued to work orders but have not yet been used. In most other computerized systems, the entire quantity of material that has been issued to a kit “disappears” from inventory as soon as the issue is recorded to the work order. Quite a bit of time may elapse before the material is utilized in production. During this period, the material is on the plant floor, but there is no indication of its existence in inventory balances. In Priority, this inventory always remains in sight. • It eliminates the need to “freeze” the recording of new transactions for the duration of an inventory count and subsequent inventory adjustments. • It manages inventory balances per part according to: catalogue number, warehouse, bin, work order/raw material lot/vendor lot, status (representing product quality or signifying that the part has been allocated to a specific customer) and production step (in the case of a partially processed part). Part maintenance is one of the cornerstones of inventory control. In Priority, you can record a vast amount of information about the part, including attributes, parameters and relationships that form the basis for usage of the part throughout the system’s modules. The contents and structure of the Parts table affects a wide variety of work processes and data processing mechanisms in the system. The table contains a large number of data fields whose attributes are dictated by the needs of the organization (e.g., column width, column type), as well as numerous keys that enable the performance of rapid queries and searches, various sorts and more. The system lends itself to revisions, including the addition of fields and joins. Inventory is identified by catalogue numbers made up of numeric or alphanumeric strings. These strings can be structured and assigned in such a way that they naturally divide parts into identifiable groups or families. Even without such a user-designed system, part catalogue numbers can be used to retrieve complex cross-sections of inventory. The system allows you to define attribute groups and families to which specific parts can then be linked, thereby facilitating part retrieval in various reports. The system also supports phantom and non-standard parts for which inventory is not maintained, but orders and financial transactions are tracked. Complex queries can be performed based on part descriptions, using logical operators. In the dual-currency package, part descriptions can be maintained in two languages. • The standard unit–the primary unit of measure is used in daily management of inventory, including inventory counts, warehouse balances and inventory transactions (sales and purchases). • The factory unit – mainly used in the construction of BOMs. You can record inventory transactions and view inventory levels in this unit, retaining a constant conversion ratio with the primary unit. In this way, for example, you can view inventory balances in two units (e.g., in barrels and in gallons), as well as receive or ship goods in the secondary unit. You can also designate an individual purchase unit for each vendor of the part (i.e., the vendor unit), retaining a constant conversion ratio between it and both the primary and secondary part units. For instance, you can record a single price for 1,000 units by making one vendor unit equal 1,000 factory units. Or you can order one package of 500 units, which are received into inventory as 500 individual units. You can record a list of up to twenty specs for each part in the Part Catalogue; these specs classify the various attributes of a part into a hierarchy of categories, which can be used to retrieve specific cross-sections of parts. You can use the Part Specs Work Area to drill down through the part specs hierarchy in order to locate specific parts. Part specs are also included in the report generators for purchasing and sales. Priority offers a unique feature — the ability to revise both the part description and catalogue number even after transactions have been recorded without compromising the integrity of the database. The Part Specs Work Area can also be used to combine various specifications in order to create new sets of parts, whose catalogue numbers and/or descriptions are generated automatically on the basis of their component specs. • Maximum repair price (for service calls). The system allows you to maintain up to twenty specifications or parameters per part (e.g., length, width, weight, color), which can then be used to run reports. The Part Specs Explorer enables you to view various cross-sections in graphic mode. Priority’s graphic interface can be taken full advantage of in viewing part information, enabling you to link up to data in other applications used by the organization, such as color pictures of the item, engineering blueprints, graphic files and the like. • You can define new parts by loading a base product into the Part Specs Work Area; the base product, as well as its type, part family, unit and routing are assigned automatically to the new parts. You can also use the work area to assign a common base product to an existing batch of parts. • You can use base products to automatically adjust the prices and discounts of linked parts. For example, if all running shoes are priced the same, you can raise the price of the base product and then run a program that automatically raises the price of all the shoes linked to it. Furthermore, if a linked part consists of several units of the base product (e.g., a three- pack or ten-pack), the program automatically multiplies the new base price by the number of units. • Base products facilitate the itemization of inventory and financial documents. By specifying a base product, you can use a Choose list to select part numbers from the list of parts linked to that product. • Most inventory transaction documents feature a print format that unites all parts sharing the same base product (as well as the same unit price and discount) into a single line. • The Base Product column appears in all the report generators and the OLAP reports. Reports according to base product provide a higher level of data analysis. For example, if you link all colors and sizes of running shoe to a given shoe (e.g., Nike, white, size 8), you can analyze your sales data for all running shoes as a unit. Priority supports a multi-level bill of materials (BOM) covering the entire processing of a given part, from raw materials through sub-assemblies to the finished product. There are no limits to either the number of BOM levels or the number of child parts at any given level. The ratio of a given parent to its child parts may be constant (e.g., four legs to one table) or it may be variable (e.g., the quantity of paint needed for the table may be a function of its area). These ratios are maintained, throughout the BOM, in respect to specific production steps, and enable backflushing, which precisely deducts from inventory of the child part once quantities of the parent are reported as processed. BOM creation in Priority is easy and rapid, supported by a mechanism that copies and updates existing bills of materials. A sophisticated Part Explorer allows for graphical display for ease of viewing. The system also supports maintenance of engineering revisions for each BOM. Priority enables you to maintain a variety of parameters that dictate inventory control policies for parts. These parameters allow you to plan and track inventory levels — information needed both by purchase planning and to locate standing inventory (e.g., WIP in a closed work order). The system allows you to record an unlimited number of alternate parts at any level of the bill of materials. During material requirements planning (MRP), production planning or issues to the floor, an alternate part can be used to resolve problems of material shortages. Priority allows you to record purchase and sales orders for non-inventory parts (i.e., parts that are generally ordered on a one-time basis and for which inventory is not maintained, such as types of services). The same catalogue number — one that distinguishes it from regular parts (e.g., 999) — is used to represent all non-inventory parts. A different description is then recorded each time you buy or sell a non-inventory part. For example, you can order office supplies from one-time vendors, render services on an occasional basis, and the like. The actual description of the part in question is recorded in the document itself (e.g., price quote, order, inventory transaction, financial transaction) and will thereafter appear in any related document. Thus, the part description specified in the purchase order is copied into the goods receiving voucher (GRV). An additional mechanism allows the cost of these items to be linked directly to a work order or to other (inventoried) parts. Priority manages inventory on a number of levels, allowing you to obtain a complete picture of current inventory from various perspectives, in keeping with operating and inventory control needs. • Warehouse and Bin – Each warehouse may be composed of one or more bins. There is no limit to the number of warehouses and bins that may be defined. You can view balances per warehouse and bin, as well as perform inventory transactions (transfers) between warehouses and between bins in the same warehouse. • Raw Material Lot or Work Order Number – You can maintain lot numbers for purchased materials, either adopting the vendor’s lot number or using a number assigned automatically by the system. You can also maintain work order numbers for manufactured parts, which are assigned automatically when the work order is opened. Work orders and lot numbers are included in inventory transactions and reports of production, allowing for tracing and data management per work order/lot (e.g., date opened, expiration date, BOM revision). After defining the necessary statuses (and the paths that connect them), you can view their attributes in the corresponding status forms. • Operation – In cases of WIP, inventory balances are maintained by the last operation performed on the part. This provides firm control over work in progress and reports of production, and guarantees the flow of exact quantities through the stages of production. • Type W – any warehouse storing goods that are not taken into account during planning (e.g., a factory outlet). In addition to these, you can define as many warehouses as you need. For most types of transactions, you can define a default warehouse that will be recorded automatically in each new transaction document. You can also subdivide any warehouse (except on the plant floor) into bins. • a bonded warehouse (for dual-currency users) – stores imported goods prior to payment of customs duties and release by a customs agent. Warehouses that are not needed can be flagged as inactive. Priority provides special tools for maintaining remote warehouses that store company inventory on consignment, either for a single customer or for multiple end customers. When goods are sold from a consignment warehouse to an end customer, the owner is invoiced by your company for the sold goods. The Replenish Consignment Warehouses program calculates current and projected inventory levels in consignment warehouses and determines the quantities of each part that are needed to replenish the supply, according to a set of inventory parameters defined by the user. Furthermore, the program can be set up to open the necessary orders automatically. Past balances are a means of freezing warehouse balances at any desired point in the past. They are often calculated in conjunction with cost analysis, enabling you to obtain inventory valuations for any past balance date. Priority allows you to calculate past balances for any date in the past. These balances are determined by starting with the last calculation of past balances and adding any inventory transactions and production reports that have taken place since. Any reports of production that fall before the date on which past balances were calculated, and any inventory transactions documented prior to that date are considered final. The calculation of past balances automatically updates inventory levels in all warehouses. Raw materials that are subject to quality control (i.e., those with a testable entry status) must undergo laboratory tests before they can be used in production. Test results are recorded and any changes in the status of the tested materials are made accordingly. System tables for test results and quality control data conform to the generally accepted norms of quality assurance, specifically those of ISO 9000. • Reject parts and indicate the reason for their rejection • Maintain expiration dates (shelf life) for parts. • Defining required tests on the level of family, base product, part or operation. • Defining possible results for each test, as well as automatic calculation of acceptability and standard deviation. • An Analysis Results form linked to all inventory documents in the system, as well as to work orders. • Printouts of Certificates of Analysis (COA). When an inventory document or production report is opened for a given part or parts, the system automatically lists the required tests for each part. Parts that are routinely tested can be assigned a default status, which they receive upon entry into a company warehouse. In order to receive a status that allows these goods to be used or sold, they must be recorded in a Laboratory Release document after receiving acceptable test results. The results received from the various tests determine whether or not a part meets the required standards. The resulting COA document accompanies the inventory transaction or production report in which the goods were first recorded. The MRB module documents and tracks malfunctions discovered during quality assurance. This module facilitates a process by which a quality inspector reports a problem in a Malfunction Document, and either decides on a solution or refers the problem to the appropriate review board (MRB). The MRB agrees on a solution and recommends ways to prevent repetition of the malfunction. These decisions and recommendations are recorded in a separate form. The quality inspector closes the malfunction document, thus completing the malfunction handling process. After filling out a malfunction document, you can link it to various inventory documents (e.g., Goods Receiving Voucher, Returns to Vendor). Priority‘s management of floor inventory allows the user to receive an up-to-date picture of raw materials on the plant floor, including components that have been issued to a kit even if they have not yet been used (the reference is to the manual issue of costly components to specific work orders, as opposed to regular issues from floor stock, automatically calculated by backflushing). In most computerized systems, the entire quantity of the material issued to the kit disappears from inventory the moment the issue is recorded. In fact, it is likely that a significant amount of time may pass until the material is actually used in the kit. During this period the material is in fact on the plant floor, yet there is no indication or record of this within the inventory system. In Priority, inventory levels are precisely maintained for these components from their receipt into the warehouses, through their issue to the floor, to their usage during production. Another difficulty in managing floor inventory in regard to kits entails the quantity issued versus what is actually used. Frequently, the quantity of the component that is needed for the kit is considerably smaller than that included in a single package of this material. When dealing with a very expensive item, which should remain in its packaging as long as it is not being used, it is common practice to issue the entire package to the work order and subsequently record a return of the balance to the warehouse. But until the return transaction has been recorded, there will be a discrepancy between the inventory balance of the part as calculated by the system and what actually exists! Priority resolves this problem by offering the option of manual, controlled issues from floor stock. In other words, the entire package of materials is issued to the plant floor (rather than to the work order), and then the precise quantity of the needed component is manually issued to the work order. Once an inventory transaction is recorded, inventory balances are immediately updated online. These updates are inherently tied to other transactions and processes in the system, so that, for instance, balances of an order item are updated when customer shipping documents are prepared; a warning is given when the defined order tolerance level is exceeded; and a warning message is received if a specific transaction will result in negative inventory balances. Recorded inventory transactions can be printed out, but need not be printed the moment the transaction is recorded. Moreover, you can print a draft version of a pending document (which still needs to be finalized). For example, a draft shipping document can be printed as an aid in preparing the customer shipment. A history of inventory transactions is maintained in the Audit Trail, which can be retrieved on the basis of a variety of criteria (e.g., date, part number, document type) and provides both control and traceability of inventory transactions. An automatic mechanism produces electronic signatures (including username, date, hour) that also aid in traceability and accountability. This mechanism is offered for virtually all actions recorded in all modules. Inventory transactions related to sales include: customer shipments, customer returns, packing slips and bills of lading. Shipping documents can be itemized automatically on the basis of one or more sales orders, whereby quantities are filled in with the current order item balance (although they may be revised) and the order balance in question is updated. You can define one or more shipping addresses for each customer. By default, the shipping document displays the address defined as the customer’s main site. This can then be replaced by one of the customer’s other sites or by a new address entered manually. The shipping address can also be inherited from earlier related documents (e.g., price quote, sales order). Each customer site can be assigned a default contact, whose name and info appear in the printout of the shipping document. A shipping document can also be used as a bill of lading to document the inclusion of one or more packed crates, each with its own packing slip, such as for shipment via a container (see “Packing Slips and Bills of Lading” below). In addition, Priority supports the loading of shipping data from an external source. When a shipping document is itemized, either manually or automatically on the basis of an order, Priority “recommends” which inventory to use by displaying available quantities of parts by warehouse, bin, work order and status. If several inventory statuses share the same attributes, and one status is more desirable for supplying customer shipments, you can assign these statuses supply priorities to ensure that the system selects the best inventory for each shipment. Once a shipping document has been recorded, you can create an invoice for the shipment without leaving the form. Or you can wait (e.g., until the end of the month) and prepare a multi-shipment invoice for a batch of shipments to this customer. The customer’s billing customer now appears in the shipping document, so that any invoice linked to the document is opened for the billing customer. Alternatively, you can record a sales invoice, which simultaneously records an inventory transaction (shipment), updating inventory balances, and a financial transaction (invoice), billing the customer for the shipped goods. You can record customer returns within the regular shipping document, by designating negative quantities, or use a customer return document, which can be itemized automatically on the basis of a shipping document or even a sales order. In Priority, quantities in customer return documents are automatically checked to ensure that the returned quantity is not larger than the original shipped quantity, which is particularly important when several returns have been opened for a single shipment. Furthermore, customer returns opened for defective parts may now be based directly on service calls. The customer’s billing customer appears in the return document, so that any credit memo linked to the document is opened for the billing customer. Goods can be packed and set aside for a specific customer prior to their shipment (e.g., in preparation for export) by recording a packing slip. This document can be itemized automatically on the basis of specific sales orders, according to their shipping balances. Once packed, items receive the status of the customer for which they are intended (e.g., their status changes from “Goods” to the customer’s number). You can also pack goods for inventory without designating a customer (for example, when selling packaged goods in regular fixed quantities). Each packing slip records the packing of a single crate. This crate can then be shipped, together with other packed crates, in containers, accompanied by a bill of lading that calculates the volume and weight of the included crates. In addition to the linkage between shipping documents and sales orders, there is also a strong connection between these inventory transactions and related financial transactions. For instance, you can follow up each shipping document to ensure that the customer is billed for the goods received. This includes the ability to produce reports that list all unbilled shipments and their details. Purchase transactions mainly entail receipts from vendors and subcontractors. Receipts from vendors can be linked to one or more purchase orders, in which case the goods receiving voucher (GRV) is itemized automatically. You can use a sub-level form to select individual purchase order items from a list of all open items ordered from the vendor in question. Quantities are based on order item balances, which, in turn, are updated by the GRV. Goods receiving vouchers can later be used to record a multi-GRV invoice received from a vendor. When recording a GRV, you can specify a separate warehouse and/or bin into which each item is received. The default entry status of each item (e.g., Hold, Goods) — a parameter assigned to the part — appears automatically, but may be revised. Items that need to undergo quality checks are later moved to the laboratory, where they are either converted to Goods or rejected. Receipt of a component that is currently needed for an open kit triggers a message to that effect. In that way, the warehouse manager is quickly informed and can issue the needed component. For parts that are managed by lots, the vendor-assigned lot number is recorded or the system provides an internal number (depending on user choice). Serial numbers may be assigned in a similar manner (i.e., either based on an existing vendor number or assigned by the system). Priority supports the use of the manufacturer’s part number instead of the vendor part number, and also interfaces with bar code readers. In place of a GRV, you can record the receipt of goods in a vendor invoice, which simultaneously records an inventory transaction (receipt of goods), updating inventory balances, and a financial transaction (i.e., a copy of the vendor’s invoice). In GRVs, as in most other inventory transactions, a budget item and profit/cost center can be linked to the transaction item. You can also distribute the costs of the purchased items among other parts or specific work orders. You can record returns to vendors within the GRV, by designating negative quantities. Or you can use a return to vendor document, which can be itemized automatically on the basis of either a GRV or a purchase order. You can record credit received for the return in a multi-GRV invoice, or (if no credit memo was received) you can send a debit memo to the vendor. Bonded warehouses can be defined and connected to shipping vouchers for importing purposes. The inventory in a bonded warehouse is managed in accordance with shipping vouchers and is divided into blocks and platforms. When receiving goods into inventory from a bonded warehouse, you can automatically itemize the GRV on the basis of balances in that warehouse by specifying the appropriate shipping voucher number. Bonded warehouse balances are updated in accordance with the quantities transferred to inventory. The cost of receiving goods into inventory is calculated separately for each partial release of goods from the bonded warehouse. In Priority, a subcontractor Is defined as a vendor with a warehouse. Inventory is controlled in this warehouse just as it is managed in any other plant-floor warehouse, i.e., inventory transactions that occur there are linked to production processes. Parts can be shipped to a subcontractor in conjunction with a purchase order for the work to be done. You can automatically itemize a shipment to the subcontractor by basing it on the kit list required by the work order in question. You can also add items in accordance with the issues plan. Often, kit components are not issued directly to the subcontractor (i.e., to the designated warehouse). Rather, they are collected in a kit warehouse as they are obtained and kept in a specific area (e.g., a section near the loading dock) until the kit is complete and/or the subcontractor is ready to receive them. Only then are the components for a given work order actually shipped to the subcontractor’s warehouse. Receipts from subcontractors are recorded on the basis of a purchase order, which automatically fills in the work order number of the kit. Consequently, the incurred subcontracting costs are attached to that work order. Once the Backflush program is run, the received parts are deducted from the subcontractor’s warehouse balance and added to your company’s inventory. Warehouse inventory transactions include: warehouse transfers, warehouse assembly, inventory conversions and inventory disposal. Warehouse transfers refer to the movement of goods both from one warehouse to another and from one bin to another within the same warehouse. They are used to document the transfer of finished goods, raw materials or subassemblies from one warehouse (or bin) to another, including transfers between company branches or from company headquarters to a branch office. They are also used to issue finished goods from the plant floor to the main warehouse in preparation for shipment to customers. If the transaction simply entails the transfer of goods from one warehouse or bin to another, it is itemized manually. However, if the transfer is of items intended to fill a sales order (e.g., from the central warehouse to a branch sales warehouse), the document may be itemized automatically on the basis of the order. Priority supports the assembly of parts in the warehouse. The recorded assembly increases inventory of the final assembled part and reduces the inventory of all child parts. Once you specify the quantity of parts to be assembled, the system automatically determines the maximum number of parent parts that can be assembled based on the bill of materials and current inventory for the required child parts. You also have the option of revising the needed component parts and their child-parent ratios manually. Moreover, instead of the bill of materials, you can designate the actual components and quantities being assembled. If the assembly involves serialized parts and/or components, you can specify their serial numbers in the assembly report. This type of transaction is documented when your organization is not interested in reporting assemblies within the framework of production — namely, when the assembly does not require extensive production resources. Nonetheless, Priority allows you to report the work hours invested in a warehouse assembly, to allow the costing program to take labor costs into account when calculating the cost of the assembled part. In certain circumstances, the need arises to correct problems detected in existing inventory (e.g., those stemming from a change in a part’s routing). To resolve these problems, the system allows you to convert inventory manually: you can change the work order number of a processed part; the lot number of a raw material; the part number; the last operation executed on a part; and/or the status of a given part. The new part “inherits” the cost of the old part, but this can be manually revised. To identify problems with inventory, Priority provides a report entitled Problematic Inventory. Priority allows you to document the disposal of unusable inventory. Only parts with a disposable status (e.g., Reject) can be treated in this manner. Once inventory disposal is recorded, the warehouse balance of the part in question is reduced. Plant-floor inventory transactions mainly refer to various types of issues to the floor. These are primarily distinguished from one another by the degree of tracing (i.e., which child parts are issued to which parents). Issues to the plant floor can be made in bulk according to an issues plan, as an issue to a kit, as a manual issue or as an issue of supplies. Items for which vendor lot numbers or work order numbers are maintained are issued in accordance with expiration dates and by the FIFO (first in, first out) method. The issues plan determines what materials are needed on the plant floor, in what quantities and on what date. This plan is generated by the results of production planning or material requirements planning (MRP). Issues to floor stock entail the periodic issue of materials to the plant floor in bulk for use in production. These materials are available for use in any work order, and their usage will be calculated automatically (by the Backflush) based on production reports for their parent parts, taking into account parent- child ratios in the bill of materials. Issues to kits are issues of materials and/or sub-assemblies that are targeted for a specific work order. They are generally recorded for relatively expensive components (like electronic parts) or when the job is sent out to a subcontractor. Issues to kits are created for each work order once it has been released. They may be revised manually, enabling you to create a specific bill of materials for an individual work order. The child parts and quantities appearing in the kit list are then taken into account by the Backflush utility in the calculation of floor inventory. Supplies are raw materials that are not included in any bill of materials, but rather are consumed during the production process or other peripheral activities of the business (e.g., lubricating oil, rubber gloves, lavatory soap and the like). The warehouse balance of the consumed parts is reduced once the supplies are issued. The Backflush creates automatic inventory transactions according to the progress of production and the demand for child parts at each step. For example, when production is reported for an interim processing stage, only those materials that are needed for that step are deducted from inventory. That is, child parts that are joined to the parent in later stages of production are not yet deducted and continue to appear as inventory on the plant floor. Moreover, the inventory of the parent part at that particular production step is increased (with the last operation appearing in the warehouse balance). Priority enables inventory counts of single part units and/or assemblies at all levels. 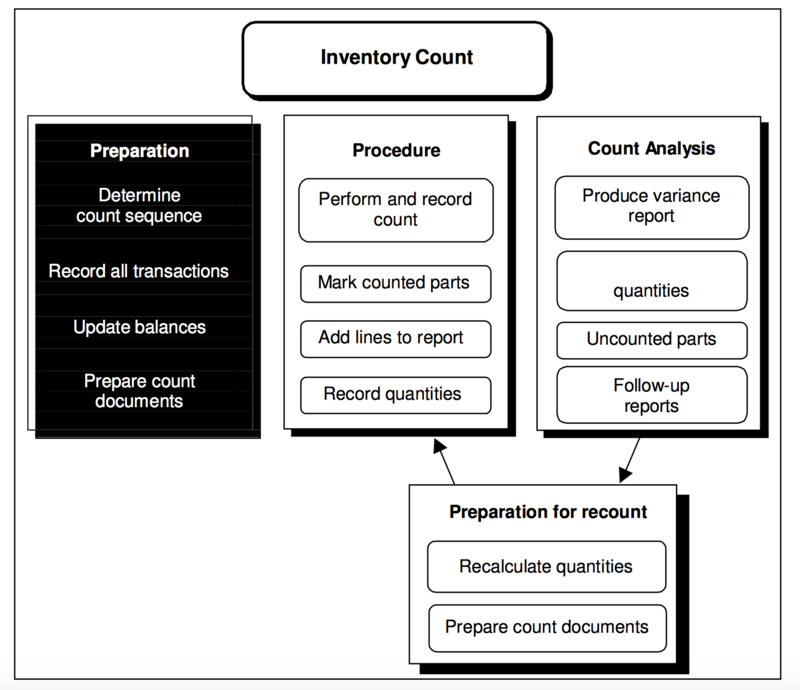 The procedure for performing an inventory count includes preparation for the count (freezing balances for the count date and ensuring that no transactions take place between the system’s calculation of quantities and the physical count), followed by the printout of a form in which to record the count (by warehouse and bin). Quantities are then copied from the filled-in form into inventory count documents, which display variance between the calculated quantity (according to balances in the system) and the counted quantity. Once a counted quantity is approved, warehouse balances are automatically updated (where necessary) in keeping with any variance. When performing the count, you can add lines manually to the count documents, manually open documents and prepare recount documents (which also take into account manually added lines and manually opened documents). Inventory counts can also be loaded from external sources. Priority provides an up-to-date picture of all inventory, including work in progress (WIP). The reports and queries in the system enable you to track inventory balances and fluctuations over periods. The Audit Trail can be used to retrieve all transactions recorded for a given part over a specified period. The system displays all inventory transactions in a single form, from which a particular transaction can be retrieved by a variety of criteria. For example, you can view inventory fluctuations over a specified period for a given part; all shipments sent out during this period regardless of transaction type; and so forth. In addition to the quantities involved in each transaction, the Audit Trail displays the relevant warehouse and bin, status of the processed part, vendor lot/work order, and cost of each transaction. The original document (e.g., a specific customer shipment) can be reached directly from the displayed transaction record. The electronic signature in the Audit Trail (displaying date and user name) allows easy identification of the user who last updated or recorded any given transaction. Unlike most other computerized costing facilities, which are generally subject to the constraints of the accounting system, Priority offers manufacturing enterprises a module specifically designed for product costing, transaction costing and inventory valuation. • Standard costing (with variances), for use with the COGS module. • Maintenance of actual cost, standard cost and last price — for each part. Priority offers a separate costing mechanism for retail businesses and a more sophisticated one suitable for manufacturing environments. Cost analysis for businesses supports part costing, transaction costing and inventory valuations calculated solely on the basis of material costs. It also has the capability of distributing additional costs, such as shipping fees. You can choose to base part costs on last prices or standard costs, instead of calculating actual costs. This method is much faster and simpler than running cost analysis. • The last price of a purchased part is updated automatically whenever vendor invoices are recorded and finalized. It can also be updated by the user on the basis of a price quote, purchase order or vendor price list, even before the next invoice is received. In addition, a part’s last price can be designated manually. You can calculate the last price of a manufactured part by means of a special program, which takes into account parent-child ratios in the bill of materials, as well as the last prices of required components. • Standard costs of purchased parts are defined manually by the user. You can calculate the standard cost of a manufactured part by means of a special program, which takes into account parent-child ratios in the bill of materials, as well as the standard prices of required components. Transactions are costed as they are recorded, according to the purchase price and the quantity in the transaction (see below). Results are used by the COGS module to record inventory transactions against inventory, COGS and variance accounts (for more on COGS, see Section 4.6). Inventory valuations are determined by the inventory balance and the cost of the part. Priority provides online costing automatically. This is in addition to the more exacting option of running cost analysis programs (see below). Online costing calculations are based on the order in which transactions are recorded in the system, not on the chronological sequence of events. Consequently, the more your record keeping reflects the order in which the transactions actually occurred, the more precise the calculations will be. • Each receipt of goods is automatically assigned a transaction cost based on available data (e.g., invoice, order). • Costing for any other type of transaction is calculated automatically, according to the Moving Average method. • Whenever a receipt of goods is recorded, the current part cost of any received item is updated by calculating the weighted average of its existing cost (prior to the receipt) and the value of the new receipt. • A warehouse assembly is assigned a transaction cost based on the actual costs of its component parts. • Whenever a warehouse assembly is recorded, the current part cost of the assembled part is updated by calculating the weighted average of its existing cost (prior to the assembly) and the value of the new assembly. Priority‘s part costing mechanism is a unique utility that allows for the precise calculation of costs, based on component parts and related transactions (e.g., shipping expenses). Unlike online costing, the chronological sequence of transactions is taken into full consideration. The costing mechanism is highly flexible. By running it in conjunction with the past balance facility (which enables you to capture and freeze a picture of inventory balances for any particular date), inventory valuations based on part costs can be calculated for any date in the past. • The FIFO method (first in first out) views the warehouses like a pipe — inventory enters and exits in chronological order; what comes in first goes out first. That is, inventory is valued according to the cumulative cost of the most recent incoming transactions (going backward in time until the entire quantity of existing inventory is covered). • The Moving Average method views the warehouses like a vat — all inventory that enters is mixed with existing inventory, and what comes out is composed of this mixture. Under conditions of inflation, Moving Average generates lower costs than FIFO. Costing for purchased items is determined by the price of the item in the transaction, plus the cost of any additional expenses (e.g., shipping) recorded against the transaction. • When no invoice is available, the price in the purchase order (after deducting discounts). • When there is no order, the part price in the most recent price list received from the vendor in question. • When no price list is available, the price in the most recent quote still in effect from the relevant vendor. Transaction costing is managed through the Cost Analysis module, rather than through inventory accounts. This allows for the retroactive adjustment of a transaction cost based on updated data — for example, when an invoice for shipping charges is received after the goods have been transferred to another warehouse. Priority calculates costs online each time an inventory transaction is recorded (that is, every inventory transaction recorded in the Audit Trail receives an updateable online value). This initial cost is updated when the actual invoice or shipping charge is received (generally after the GRV is recorded). • In the case of a receipt of goods from a vendor,or a return based on that receipt, the (updated) entry value is taken. For instance, if the receipt was initially costed based on prices in a quote from the vendor and an invoice has been received, the cost is now based on the prices in the invoice. • The same holds for any other transaction in which a purchased part is involved, so long as its lot number can be traced to the original GRV. • Any other transaction is costed according to a moving average. 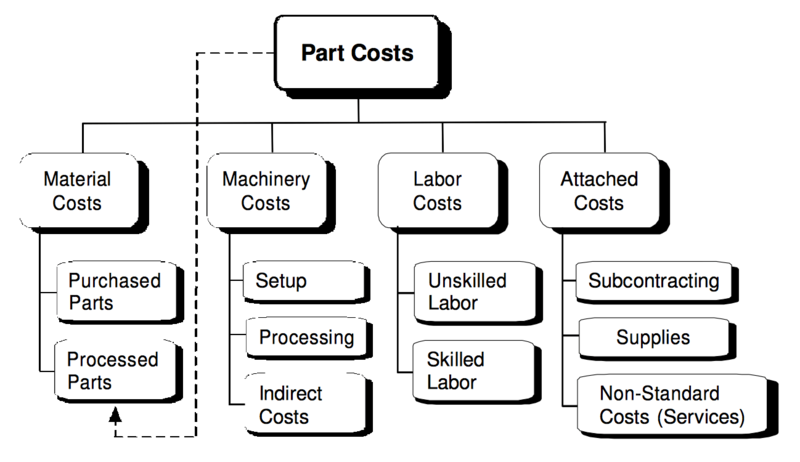 In addition to all of the costing options offered in the Cost Analysis for Business module, Cost Analysis for Manufacturers provides for the costing of processed parts, taking into account the bill of materials, the routing, labor and machinery costs, overhead on the plant floor, other attached costs (set-ups, subcontracting, rework), and production reporting. Like Cost Analysis for Businesses, it also calculates the costs of purchased parts, both those used as raw materials in the production of processed goods as well as finished items sold to customers. Here, too, transaction costs derive from part costs and serve as the basis for the Cost of Goods Sold (COGS) program. Inventory valuations may be based on actual or standard costs. The costing programs for manufacturers enable calculations of standard and actual costing, where the latter may be determined by either the Moving Average or FIFO method. The standard cost of a processed part derives from the sum of the standard costs of its raw materials and the standard production costs of all sub- assemblies in its bill of materials (BOM), based on parent-child ratios recorded during factory modeling. There are three types of recorded standard machinery costs: direct costs for job processing, direct set-up costs and indirect costs. There are three types of labor costs: direct costs for job processing, direct set-up costs and indirect costs. There are two methods of calculating labor costs, depending on whether the worker is skilled or unskilled. The direct and indirect costs of skilled labor are defined per skill. There are three types of costs that are added to standard part costs: the standard cost of using a subcontractor, standard charges for related services or non-inventory parts, and standard charges for supplies. • Standard subcontracting costs refer to the average cost of subcontracting for the part in question. • Charges for related services (non-standard costs) refer to the average burden added to the part cost from orders of non-inventory parts (e.g., consultations, storage). These are charged to the part when they are purchased. • Charges for supplies (supply costs) refer to the average expense added to the part cost from materials required for production that are not part of the BOM, but which are necessary for production (e.g., machine oil, pencils, lavatory soap). These expenses are charged to the part when the supplies are issued. Priority is capable of managing product costing and inventory valuation for each individual work order. The cost of the part in question is calculated, either by the Moving Average or the FIFO method, in accordance with costs of any work orders closed during the designated costing period. Costing of an open work order (required for inventory valuation) is determined by its accumulated production outlays less the cost of the quantity (for the same work order) that has already been transferred to a warehouse. The cost of the transfer is calculated by multiplying the quantity of items involved in the transaction by the part’s standard cost. When work orders are not maintained for a particular part, the part cost equals its standard cost. The one exception to this rule is assembled parts (warehouse assemblies); these are calculated by reported quantities of assembled components multiplied by their actual costs. Whereas the costing of purchased parts simply entails linking their purchase price to any given inventory transaction, the costing of manufactured items also requires the calculation of production costs. Moreover, for many processed parts, costs are calculated per individual work order. Costing for a work order needs to take into account the costs of any component work orders (i.e., the work orders of child parts). As at least some of these parts are likely to be issued to the parent before their costing has been calculated (because final costing is not determined until the work order is closed), the cost recorded for them does not necessarily reflect their actual cost. Consequently, in the absence of a retroactive update of the value of issues to work orders (both for purchased and manufactured parts), the calculated cost of the work order is considerably removed from the actual cost. In most costing systems, work order costing is carried out by opening an account or cost center and attaching the costs of transactions to it. This approach is problematic when it comes to recording costs other than those of materials, such as labor, machine time, set-ups, rework and indirect production costs. Priority‘s product costing system, in contrast, applies an innovative approach to the costing of work orders, based on reported production. A special program records all the outlays that have accumulated and/or been updated for a specific work order since the last costing run. It also takes into account the standard costs of completed but unreported production steps (based on the part routing). In this way, the user receives an up-to-date picture of all the actual costs for the work order in question. The actual cost of a manufactured part is determined by the costs of all work orders for that part that have been closed since the last costing run. This calculation is made on the basis of either the Moving Average or the FIFO costing method. If no work order has been closed, the part’s actual cost is copied from the previous costing run. If this is the first run, it is determined by its standard cost. The cost of a given work order is determined by its own processing costs (machinery and labor), material costs and additional costs, as well as those of any child parts in the part’s bill of materials. Processing costs are calculated on the basis of production reports for the work order in question (e.g., quantities reported, machine time, labor time, employee number in the case of skilled labor). For any unreported operations in the routing (i.e., floor inventory that is estimated by backflushing), standard production costs are be taken into account. Finally, additional costs are determined by the costs of any subcontracting, supplies, purchased services and the like that have been charged to the work order in question. Another difficulty in managing floor inventory and assigning costs to processed parts stems from the issue of items to kits (i.e., the manual issue of costly components to specific work orders, as opposed to regular issues from floor stock automatically calculated by backflushing). Frequently, the quantity of the component that is needed for the kit is considerably smaller than the quantity included in a single package of this material. When dealing with a very expensive item, which should remain in its packaging as long as it is not being used, it is common practice to issue the entire package to the work order and subsequently record a return of the balance to the warehouse. If the work order has been closed (or costing has been calculated) before the warehouse return has been recorded, its actual cost will inaccurately include the cost of all the material in the package, and not just the amount actually used for the work order. Priority resolves this problem by offering the option of manual, controlled issues from floor stock. The entire package of materials is issued to the plant floor (rather than to the work order), and then the precise quantity needed is issued manually to the work order. As with costing for businesses, you can maintain last prices for all purchased parts. In addition, a special program allows you to calculate the last prices of processed parts, based on all parent-child ratios in the BOM, as well as the last prices of any required raw materials. The program updates the last price not only for the designated final product, but also for any intermediary parts in its BOM of materials (i.e., sub-assemblies). You can also designate a last price for any manufactured part manually. One of the most important tools Priority provides for determining inventory values for any given date is the ability to calculate past balances. This mechanism allows you to obtain a picture of inventory at any set moment in time, and specifically for a date in the past. Inventory valuations are carried out on a past date whenever the Costing for Past Balance Date program is run. This enables the dynamic calculation of inventory values, as past balances can be calculated for virtually any date. Valuations take into account the quantity of inventory on the past balance date (past balance quantity). In addition, inventory valuations can be calculated for today’s date by running the Costing for Current Date program. The value of inventory in an open work order that is still on the plant floor is determined by the total value of production outlays for the work order in question and for all children at all levels of the part’s BOM, less the (standard) value of any quantity of that work order that is no longer in the factory (e.g., because it was issued to a parent part, sent to the customer, disposed of). Only inventory in warehouses (including the plant floor) that are flagged for costing are taken into account. Part Inv. Valuation per Part No. • The ABC for Material Inv. Valuation report displays the value of material inventory according to ABC class, for a specified costing date, calculated by last price, standard cost or actual part cost. • The ABC for Raw Materials report displays the total value of all issues of raw materials over the designated period, according to ABC classes. The types of issues covered include issues to floor stock, issues to kits, manual issues, issues of supplies, warehouse assemblies and automatic transactions (i.e., backflushed issues). The designation of percentile values for each class is flexible and determined by the user. The predefined defaults are 10%, 20% and 70%. In the ABC for Raw Materials report, the value of issues for a particular part determines the ABC class to which the part is allocated. The report compares the part’s “standard” class with the class assigned to it over the period for which the report is run. The former remains constant over time, whereas the latter may change every time a new report is generated. Both are displayed in the report. Priority allows you to use Bartender to produce labels containing information from the system’s database (e.g., catalog numbers, product descriptions and bar codes). The information is loaded into a work area from which it is printed in the form of labels, using designs created in the label software. Unbilled Docs. by Customer No. Unbilled Docs. by Document No. Sales Rate by Part Report Gen. Sales Rate by Store Report Gen.